We’d love your help. Let us know what’s wrong with this preview of The Triumphant Footman by Edith Olivier. To ask other readers questions about The Triumphant Footman, please sign up. 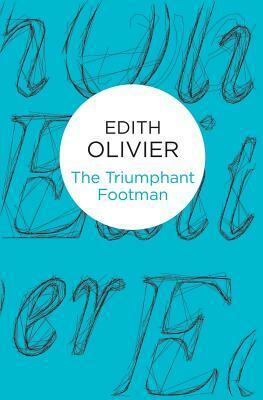 The Triumphant Footman is one of Edith Olivier's five novels, and was first published in 1930. The volume has been dedicated to war poet Siegfried Sassoon. The Triumphant Footman takes place largely within the upper-class circles in Italy. A lot of the plot within the novel revolves around the mischievous half-French footman of the Lemaurs, Alphonse Biskin. A case of mistaken identity ensues, confusing society to its limits, and all of which he is responsible for. This element of the story is far The Triumphant Footman is one of Edith Olivier's five novels, and was first published in 1930. The volume has been dedicated to war poet Siegfried Sassoon. The Triumphant Footman takes place largely within the upper-class circles in Italy. A lot of the plot within the novel revolves around the mischievous half-French footman of the Lemaurs, Alphonse Biskin. A case of mistaken identity ensues, confusing society to its limits, and all of which he is responsible for. This element of the story is farcical at times, and causes the whole to become almost a comedy of manners in its consequent tone and style. Olivier sets the scene wonderfully from the very beginning: 'Shadows gathered in the corners of the high Florentine drawing-room, and the faded frescoes on its walls assumed a new prominence in the half-light. The room became ghost-like, and the painted figures were ghosts among ghosts. These shadowy forms, the gilded furniture, the heavy brocade hangings, and the curiously wrought silver goblets and vases which stood on consoles against the walls - all of those things seemed far more truly the living occupants of the room than the little pale lady who was lying near the window'. This 'little pale lady' is Mrs Lemaur, a woman who decided to change her life whilst still in her teens: 'When she was eighteen, she had decided that to be bedridden should be her role'. She is the 'little wifie' to a Captain, who 'liked looking for bargains, and he often found them'. Both relocated to Italy - Florence, to be exact - some decades ago. Olivier builds her characters by using the finest of details; Mrs Lemaur, for example, has a 'little face' which is 'puckered and wrinkled in criss-cross squares, and the corners of her mouth were drawn down till they seemed about to slip off from the two sides of her chin'. Captain Lemaur is a shadowy being in comparison to the descriptions of his wife; she 'had passed her life surrounded by love and by things of beauty, but she deserved neither of these'. Mrs Lemaur is definitely the most interesting creation in the book, and none of Olivier's other characters feel quite as vivid or memorable as she does. Edith Maud Olivier MBE was an English writer, also noted for acting as hostess to a circle of well-known writers, artists, and composers in her native Wiltshire.